Three WB-57 aircraft shown flying in formation. 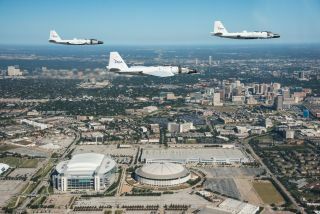 Two WB-57s will take to the skies to study the Aug. 21, 2017 total solar eclipse. Millions of people will turn their eyes toward the August 2017 total solar eclipse, but most of them will be on the ground. Over Tennessee, however, two scientists will be observing the incredible event from the cockpit of a pair of modified bomber aircraft. Rising above the turbulent atmosphere, the planes will carry high-definition cameras that will observe the structure of the sun's outer layers in remarkable detail. The scientists will also use this unique opportunity to make some less obvious measurements: They'll measure the temperature of the planet Mercury and, if they're lucky, they may even spy remnants of the early solar system. In addition to their stunning visual show, total solar eclipses provide a wonderful way for scientists to study the sun. While the moon blocks light from the star's central body, the fainter outer layers of the atmosphere can be studied in great detail. A number of Earth-based observatories will take advantage of the opportunity to probe the sun on Aug. 21. Even the highest altitude observatories must contend with the way the Earth's atmosphere can blur light coming from objects in space. By taking flight in a pair of WB-57s, the American version of the British B-57 bombers, Tsang's instruments will rise above much of the atmosphere. The aircraft are part of NASA's Airborne Science Program. Essentially high-definition television cameras, the instruments will be able to study high-frequency events in the outer layers of the sun, such as the nanoflares that help redistribute energy from the magnetic field to the plasma. The device to be flown on the WB-57s will capture 60 frames per second, Tsang told Space.com. That will allow the cameras to capture short-lived aspects of the corona better than satellite cameras with a slower frame rate, Tsang said. The bombers will also extend the amount of time available to study the sun's outer layers. The so-called path of totality refers to the region on the ground where the total eclipse will be visible. The moon's shadow will move across the U.S. from west to east. At any point on the ground, the sun will be totally obscured by the moon for a maximum of about 2.5 minutes. But each high-speed aircraft will bump that time up to just over 3 minutes, because they will be able to chase the moon's shadow and briefly extend the duration of totality observed. However, the shadow will move at more than three times the speed of sound (2,400 mph, or 3,900 km/h), much faster than the bombers can hope to keep up with. The two planes will fly in formation, separated by about 50 nautical miles, Tsang said. As the first plane flies out of the path of the eclipse, the second should just enter it, creating back-to-back observations of the corona. But the sun won't be the only star of the show. While in the air, the cameras will also observe Mercury for 10 to 15 minutes. The closest planet to the sun, Mercury will be only a slim crescent in the sky. Its proximity to the sun makes it challenging to observe from the ground without an eclipse. Tsang and his team will take the opportunity to study the planet in the infrared light, which can be used to reveal the temperature of objects that are not quite hot enough to start radiating visible light. The new observations will help reveal how the planet is losing heat, Tsang said, and combined with previous measurements, they should provide insights about the interior of Mercury. "These will be the first measurements of their kind," Tsang said, pointing out that the infrared range captured by these cameras is outside the range studied by spacecraft such as NASA's MESSENGER mission to Mercury and the upcoming BepiColombo, a joint mission between the European Space Agency and the Japan Aerospace Exploration Agency. Along with gathering new information about Mercury, with a little luck the scientists may catch a glimpse of the early solar system. The eclipse provides an excellent opportunity to hunt for Vulcanoids, hypothetical objects leftover from the beginning of the solar system, Tsang said. Vulcanoids are thought to travel around the sun in stable zones inside of Mercury's orbit, and may have evaded detection, thanks to small sizes and the glare of the sun. During the eclipse, the sun's bright light will disappear, allowing Tsang's team to search for Vulcanoids by hunting for moving objects across the background field of stars. The process is similar to hunting for asteroids and near-Earth objects farther out in the solar system, though those hunts span days rather than minutes. "We don't have the luxury of waiting a couple of days," Tsang said. A WB-57 aircraft, part of NASA's Airborne Science Program. Almost since the invention of airplanes, astronomers have taken to the sky to peer at the heavens, according to a report from the American Institute of Aeronautics and Astronautics (AIAA). On Sept. 10, 1923, a fleet of Navy planes launched with the goal of determining the centerline of the solar eclipse. (The centerline is the very center of the path of totality; the duration of totality is longest at the centerline, and shortest at the edges of the path). Solar eclipses remained the primary focus of airborne astronomy until the 1960s, when NASA launched the Galileo aircraft, which was dedicated to studying astronomy, according to the AIAA report. Instruments on the plane studied comets, meteor showers and Mars until Galileo's tragic crash in 1973. The Kuiper Airborne Observatory, which operated from 1973 until 1995, hosted an open-port telescope that discovered the atmosphere around Pluto and rings around Uranus, among other things. In 2007, the Stratospheric Observatory for Infrared Astronomy (SOFIA) took flight and is still operational today. Both the KAO and SOFIA allow scientists to ride inside the airplane as passengers, while the instruments take observations. Tsang flew aboard SOFIA earlier this year to make observations of Venus. But the WB-57s are a different kind of beast. Based out of Elliston Air Force Base in Houston, the American-built bombers have been flying research missions since the early 1960s. The modified bombers have only two seats, and typically, the rear seat is occupied by a NASA employee serving as a sensor equipment operator, or SEO. If a scientist wants to take the place of the SEO, he or she has to serve as a co-pilot. Observing scientists must undergo completely different training than required for SOFIA. The WB-57 will fly at 50,000 feet, "just below where you need spacesuits," Tsang said, referring to the protective pressure suits worn by high-altitude pilots. Flying as a participating scientist on one of the WB-57s would require two to three months of training, in addition to the training Tsang has already undergone as part of a private flight aboard an L-29 military jet several years ago. That flight was part of his training for flights aboard suborbital space planes. Two WB-57 aircraft will carry instruments to study the Aug. 21, 2017 total solar eclipse. "This would be new to me," said Tsang, who has a glider license and is working on his single- engine license. The project combines what he calls his two passions, astronomy and aviation. While most astronomy is stationary and safe, taking place behind a telescope or, more recently, behind a computer screen, co-piloting a WB-57 would be more hands-on, Tsang said. "I'm a classical astronomer," he said. "I like to come up with an ideal, figure out if it's possible, and make the observations and see what I get. I like the thrill of discovery by getting hands-on and dirty." In 1997, SwRI scientist Alan Stern flew aboard a WB-57 to observe Comet Hale-Bopp, but when the aircraft take off to observe the eclipse, it doesn't look like Tsang will be in the cockpit. In the past, the pilot and co-pilot could eject themselves separately in an emergency, but since Stern's flight the seats have been refit, and today either one could eject both. Ejecting can be extremely dangerous for the co-pilots, not to mention for people on the ground, and Tsang attributes NASA' rejection of him in large part to this — perhaps more experienced pilots don't want to put their fate in the hands of a less-experienced counterpart. Tsang, who has been working on this mission concept since 2010, is still hoping the agency will change its mind, but thinks chances are slim. If he can't be inside one of the bombers, he won't be on the ground to see the planes take off without him from Houston. Instead, he'll travel to a location where the total solar eclipse is visible. "Having fought so hard, it would be hard to watch an SEO enjoy that and know that that could have been me," Tsang said.